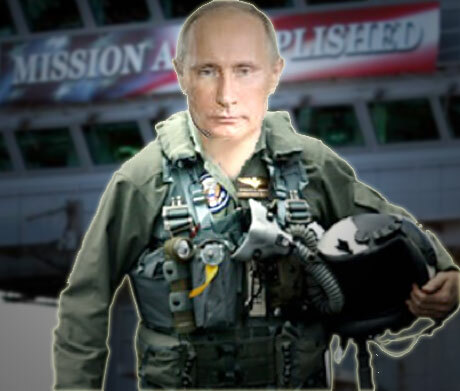 Now it is Putin’s “Mission Accomplished” moment in the Middle East. Who can say what Putin’s long term objectives are, but regardless, he has won this round. His decision to bring Russian troops into Syria has weakened ISIS, secured Assad’s regime (for now) and put American aggression into check. Perhaps the ceasefire in Syria means that WWIII has also been averted, or at least delayed. The global chess game is hardly over, but President Putin managed to time his moves with the precision of a master. For all its heightened rhetoric, the other side blinked on the supposed “red line” in Syria. After Vladimir Putin spent considerable effort politely calling out the hoax behind the ISIS crisis in Iraq and Syria – which has been covertly supported by the U.S. and 40 other countries, many of whom belong to NATO – the White House eventually seemed reticent to even go on pretending that it has a case against Assad, or a moral position in the rise of ISIS. Seemingly, the entire broiling situation has been defused… for the moment anyway. Erdogan, not Putin, has been caught engaging in a charade, pretending to fight against ISIS while in actuality funding and fueling their rise in the Middle East. It was Turkey who lost all legitimacy as a result of shooting down Russian planes, not the other way around. The double game was revealed, and Assad is clearly relieved at the “save” on Putin’s part. For Assad, it can’t take much imagination to watch Saddam Hussein and Gaddafi go down, and know that they had plans for him next. As many recall, Putin’s war on terrorism quickly made a mockery out of Obama and Bush’s War on Terror, which has raged on for 15 years only to face setbacks and blowback that has created many fold more terrorists than the region started with. Saying that Russia’s Air Force in Syria has conducted more than 9,000 sorties starting from September 30, 2015 […] “As a result of airstrikes, terrorists’ resources’ provision has been largely cut,” Shoigu told Putin, saying that petroleum trade routes with Turkey, as well as main routes of weapons provisions to terrorists have been blocked. Nevertheless, the world is hardly peaceful, and with so much angst over the sour deal with Iran and the rise of Trump-lican politics, people would be best to stay on watch for nasty tricks and devilish surprises.